Flanges and forgings in stainless steel, chrome-moly steel or aluminum: Western of Texas Forge and Flange Co.
Western of Texas Forge and Flange Co. has Forging, Machining, and Heat Treating capabilities for production of any flange, ring or special forging requirements you may have. Our products are manufactured in accordance with ASME B16.5; B16.36; B16.47; and MSS-SP-44 in addition to industry and statutory standards as required. All markings are as per MSS SP-25. Over 30 types of materials are stocked in our inventory including stainless steel, chrome-moly steel, aluminum, high nickel alloys and other special materials. This wide range of in-stock inventory allows Western of Texas to begin production immediately upon receipt of your forging or flange order. 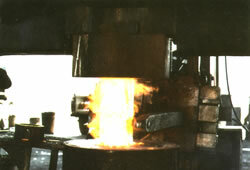 Western of Texas Forge and Flange Co. has built a reputation for expedited delivery of the quality products our customers have come to trust. Pressure Range: 150 through 2,500 lb. 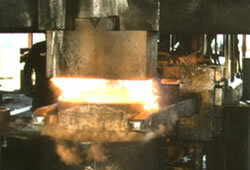 Manufactuing capabilities include open die hammers from 4,000 lbs. to 12,000 lbs., a 2,500 ton hydraulic press, and a ring machine. 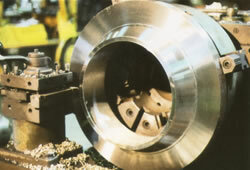 Die forgings are made for 1/2" to 24" nominal flanges. Expertise and in-process quality control are the key ingredients of our production program. 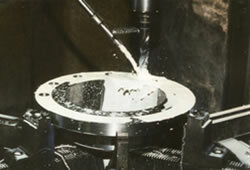 Total in-house machining gives us complete control to maintain on time scheduling.